We’ve made it through the countdown and have reached its end with today’s post. Throughout the past month, we have outlined ten reasons Bears fans should give a damn about their team in 2016, and saved the best for last. Not all fans need reasons to give a damn as they will care about this team through thick and thin, however, that is not the case for all. Some need reasons to give a damn, and the Bears current coaching staff is the strongest reason to do so. Leadership starts from the top and trickles its way down the depth chart. The Bears coaches are not just solid coaches but are also exceptional leaders of men. John Fox has done the impossible by replacing the atrocious culture that embedded itself within the franchise during Marc Trestman’s tenure. He’s done so by adding coaches that bring their passion to the field every day and strive to get the most out of their players. Here’s a handful of coaches and why Bears fans should give a damn about their presence. For Bears fans, an important number to keep in mind is two. The number two is special because this is Fox’s second season as head coach of the Chicago Bears. Fox has a reputation for turning teams that were at or below .500 in his first season as head coach into teams that have double-digit wins in his second. In 2002, the Carolina Panthers were 7-9 and failed to make the playoffs. Then season number two happened. In 2003, Fox’s Panthers went 11-5 and not only made the playoffs but went on to play in the Super Bowl, ultimately losing to the New England Patriots. After nine seasons with the Panthers, Fox became head coach of the Denver Broncos in 2011. In his first season as head coach in Denver, the Broncos went 8-8 and did make the playoffs, losing to the New England Patriots in the Divisional Round. In year two, the Broncos won 13 games, earning themselves a first-round bye, but were upset in the Divisional Round against the Baltimore Ravens. Although neither team was unable to win it all, each improved their number of wins and made the playoffs in Fox’s second season. Keep in mind, the last time the Bears were in the playoffs was five long years ago. Let’s see if Fox can keep that reputation alive in his second season with the Bears and help end a playoff drought that has been daunting the city of Chicago for far too long. Coach Loggains has already made an appearance on the Give a Damn List. If you read it, you’ll remember how it discussed Jay Cutler and how he can be compared to Matt Hasselback when Loggains was in Tennessee. However, there are more aspects to the offense than just the quarterback. It has become apparent that there are issues on the offensive line. Two big pieces to the puzzle are out with an injury at the moment (Kyle Long and Hroniss Grasu). Leaving the replacements to be veteran Ted Larsen at right guard and Cornelius Edison at center. Leaving the rookie Cody Whitehair to learn the ropes on the job at left guard (which we are all anticipating he will do just fine). How Loggains handles the injuries up front is something to keep an eye on this season. Another reason to give a damn? Which running back will Loggains pick to take over the committee that John Fox likes to use? From 2010-2013, when Loggains was the offensive coordinator in Tennessee, Chris Johnson was a 1,000+ yard rusher each of those years. In the first year of the post-Matt Forte era, who will be that running back that the offense can lean on? A third reason to give a damn is how Loggains utilizes Alshon Jeffery and Kevin White (on account that both can stay healthy). The offense has been stagnant in the preseason. 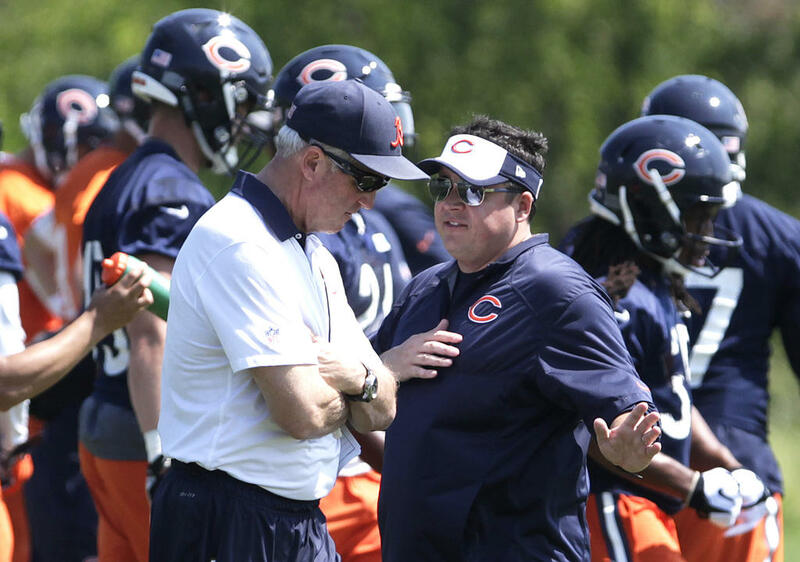 Is Loggains hiding his cards until Week 1? Are the offensive struggles a legitimate concern? All are reasons to give a damn about Loggains. Defensive coordinator Vic Fangio is in his second season with the Bears. He was able to get the most out of the overwhelming squad last season, and with a retooled defense to work with, things should only get better for the Bears on defense. This is a reason why Bears fans should be amped up for this upcoming season. The starting defense will feature two stud linebackers in the middle with Danny Trevathan and Jerrell Freeman. These two instinctive, high-motored linebackers will make the city of Chicago forget about the days when Shea McClellin and Christian Jones, unfortunately, started at inside linebacker. Another stud is defensive end Akiem Hicks, who from the start of training camp has none nothing but impress the coaching staff with his speed and strength. Then there are the rookies Leonard Floyd and Jonathan Bullard, who have had flashes in camp and the preseason of what type of players they can potentially be. With all this being said Fangio has some new “dogs,” as outside linebacker Pernell McPhee likes to say. These new additions along with veterans like Willie Young, Lamarr Houston, and Tracy Porter will help push this defense to make strides in the right direction. In Fangio’s first season he turned a defense that was ranked 30th in the NFL in total yards in 2014 into the 14th best defense. It will be interesting to see what he can do with new additions and how he utilizes each player to the best of their abilities. Seriously, an outside linebackers coach with the last name Hurtt is a reason to give a damn by itself! What a fitting name for the position coach. Hurtt was with the team in 2014 as the assistant defensive line coach, in which the defensive linemen produced 35 of the 39 sacks the Bears recorded in 2014. The team as a whole in 2015 had 35 sacks, if the defensive lineman can produce their fair share of sacks, and Hurtt can get the outside linebackers to produce 35 sacks…it is going to be a fun year! Now in 2016, he has four guys that can bring the “Hurtt” to the opposing offenses. He’s got McPhee, Floyd, Houston, and Young in his repertoire to play with. Young went from asking for a trade to earning an extension, Houston is back where he feels more comfortable in a 3-4 scheme and led the team in sacks last season, McPhee is a bully that Hurtt has not gotten to work with in the past, and lastly, he can turn Floyd into whatever he wants as there is no pressure for Floyd because of the three other guys to game plan for (in the outside linebacking corp anyway). These outside linebackers are going to be as good as the guy coaching them, and if Hurtt can motivate his “dogs” to produce big sack numbers like he did in 2014 with the defensive lineman, that too is a reason to give a damn! Wide receivers coach Curtis Johnson demands perfection, whether it’s in the film room, on the practice field or on Sunday’s at Soldier Field. Johnson coaches his receivers with a drill-sergeant mentality and isn’t shy when it comes to critiquing his unit. Kevin White knows first-hand what it’s like being coached by the 54-year-old. This Bears receiving core can’t be average this season, it has to be stellar for the Bears to be competitive this season, and Johnson is the perfect man to bring out that competitive fire in each guy. Jeffery has already brought out that fire when he got in a facemask battle with Patriots cornerback Malcolm Butler during the inner-squad practice a couple weeks ago. White sat out the entire 2015 season and Johnson is someone who can push last season’s seventh overall pick to make the impact all Bears fans expect. Johnson will demand the best from everyone and that includes veteran Eddie Royal, second-year man Joshua Bellamy and even seventh-round rookie Daniel Braverman. Being mediocre isn’t an option for Johnson and he won’t let any of his receivers do that. Even though most of the focus has been on what players have been brought into Chicago, Bears fans can rest assured that the organization has the right men in place to lead this team. This strong coaching staff, led by Fox, will get the most out of the roster each and every year. That’s the biggest reason to give a damn in 2016.